I could listen to the Ranmo sing for hours. The melodies are somber. They are not joyless, just serious like some of our old hymns. They know life can be hard. They live it every day. But they know God is a good father and worship despite hardship. It took four days to get to Indorodoro. Rain season is not supposed to have started yet. Our trip began by airplane in the Eastern Highlands. When we landed at Moorehead the people there told us the pontoon barge (used to float vehicles across the river) was sunk (again), and no vehicles could go that way. Fifty kilometers of swamp and flooded rivers were between us and the village; rain season is not supposed to be here yet. So we flew to Bensbach, a few kilometers from the Indonesian border and the western-most river in Papua New Guinea. The next day we were able to hire a dinghy which took us as far as Weam. The trip took several hours following the river through flooded marshland as flocks of birds flew up and away from the boat. Herons and hawks, rare birds of paradise and parrots of all kinds kept their distance as the boat made its way through the marsh. Several hours of travel on the river and we only passed one village; there is more wildlife out here than people. It’s hard to discern the difference between the river and flood land but our boat operator knows it better than I know my house in the dark. We arrived at Weam, a government airstrip routinely shut down due to lack of maintenance. The Papua New Guinea Defense Force has a unit stationed there but they’ve not been resupplied or paid in months. They buy food from the locals and fuel from Indonesia but their cash flow is running low. After two days in Weam we were able to pay some locals to go to Sota (Indonesia), to buy fuel for the Defense Force Land Cruiser. It has no brakes and even though they are on their second transmission third gear howls like a banshee. The front drive shaft and axles have been removed reducing it to two-wheel drive status, but it runs okay as long as it has fuel. I learned later that truck is only one year old. Half way between Weam and Indorodoro we came to a village called Gariam. At least now we were in the same language dialect as Indorodoro and Jessica could communicate clearly in Ranmo. In Gariam the creek was flooded to chest deep over the bridge. The bridge consisted of two logs per tire and we had to feel where they were in the murky water with our feet. If the truck could not stay on the logs the water depth was over head. End of the road; time to walk. Because this village was within Jessica’s translation project the people knew her and were willing to help. After crossing the flooded creek they loaded our supplies onto the makeshift racks they use on their bicycles and headed for Indorodoro. The rest of the way was a mix of flooded road and occasional dry. Though mostly not more than ankle deep the weather shifted from monsoon rain and wind that we could hardly talk over to dead calm sun and steam rising from the road, all within a few hours. That last stretch took five hours to hike. We had finally reached Indorodoro where we could begin our village stay. A baby died the day we arrived. The baby was only a few hours old. And the young mother soon followed. In Ranmo there is a term for a friend that is closer than family. This young woman was that friend to Jessica. The conditions that we had to navigate to get here are the same for the locals to get out. Had they been able to get to Kirua airstrip in time there might have been a chance to at least fly the mother to a mission hospital. But to carry an unconscious adult through a swamp is difficult and when they came to the first river crossing they had to stop and build a raft out of bamboo. She died in the jungle only part way there. The funeral and hauskrai consumes village life for some time afterward. The people’s grieving tradition involves loud and prolonged wailing. It goes on for hours over the course of several days and can be heard throughout the entire village. As family members arrive from distant villages they begin their wailing at the edge of the village and continue for quite some time after reaching the body. Ruth’s elderly aunt carried a yere on her back, a woven basket full of garden produce. She sang about how they used to plant and harvest together and that her brother’s daughter would no longer be able to help. All of Ruth’s loved ones had an attribute, a story, a song. And they were all expressed simultaneously in a cacophony of singing, wailing and sobs. The coffin was being sawn and hammered together just a few feet away, repurposed from a wooden table. And the sound was a part of the chaos. Just behind the house, a few feet in the other direction, they dug the grave, water and soupy mud flowing in as fast as they could scoop it out. Little boys bailing water, men digging with shovels. Some threw themselves over the body or coffin or grave. And the crying continued long into the night. There is much to be learned coming to a place like Indorodoro. And we are not always the teachers. Building with my boys has made me a better mom. Firstly, in writing this I am throwing no shame on any other moms. Just talking about how I feel within my relationship with my boys. Nothing else. M’kay? Moving on. L and J have reached that age where toys like legos and model airplanes dominate our house. They are super creative, and while they enjoy following directions and building something that is part of a “set” they also love digging around in the bins and building all sorts of wild and frankly impressive creations out of their heads. Everything we have we have acquired used (except for a few that were presents, were built once and then went into the bins. Admittedly, when I look at the bins, and the scattered bits as they dig and search for that particular piece, I sometimes really wish I could be that pinterest mom with the “Ikea lego storage hacks” and the label maker. Granted, while I do have a label maker, I get a little slack as the nearest Ikea is over 1,300 miles away….in another country. They are still young enough that they, in part, need adult help to make certain things, and sometimes I think they just want to spend that time sat on the floor or at the table getting messy with mom or dad. I will be the first to admit that structural engineering, spatial awareness, print reading…any of that kind of thing, is REALLY not my forte. I am also really bothered when I do something and it doesn’t quite come out as it “should”. And though the current state of my house may attest to a different ethos, I much prefer tidiness and organization makes me calmer. All these things combined make it quite a challenge for me to participate fully even when the sweet little boy voice says: Mom can you help me with this? God is teaching me. I am growing through my boys. Despite the discomfort, I am learning it is okay to have legos turn up in every corner of the house, and have half-finished projects lying around in baking trays (the only way I have found to keep the pieces we have gathered together). Patience, allowing the imperfect to pass because it brings joy, thinking outside the box, and being content with the simple. We have even had lessons in economics, and in genuine vs fake. We acquired some fake legos, which bore the logo “Lebqu” on the little display plate. They look ALMOST like legos, but the colors are a bit off, and they don’t stick together like they should. We have since watched a couple of really great lego documentaries that explain why this is so. So, now we use the lebequ as examples of why it is good to buy less of a more expensive product if the quality is better than the cheaper brand. We also talk about how sometimes seems okay, but when it comes under scrutiny, whether it is a person, a job or an item, the genuine article is a better investment. Not your average prescription from a doctor in the US. But this is exactly, amongst other things, what was suggested we do for our boys recently. Liam and Julien are awesome kids who have taken their parents call to missions in stride from our first in-person meeting with our then recruiters (pic of me with Liam) – to give fair dues to the rather unflattering picture of me, if I recall correctly Liam was maybe a month old at this time. To the leaving of the familiar, and giving them a peculiar paradigm of home forever starting at 18 months and 2 years old. Yes, our boys have gone through many, many transitions in their young lives. Not all of them pleasant, many of them hard enough to make even grownups cry. They have had to say goodbye to friends, knowing they may never see them again. They continue to have to do this – This week, Liam had to say this kind of good bye to a friend who he calls his “second best friend”, and whose family has been a source of comfort and friendship for all of us. His “best friend” left a few months ago. That is the nature of living in a mission community. One challenge we have been working through is having two children who are brilliant but have some learning difficulties. We are working through various ideas and aides with the school, with their doctor and on our own. I have a list started of things to look into the next time we are in the US on furlough. In the meantime, I am continually impressed and encouraged by the others in our community that care for us and our boys. Teachers who pray with us when we have meetings at the school, or sometimes in the store when they see us and ask how things are going. Administrators who e-mail after seeing one of our sons crying after school, to make sure he was okay and ask if there was anything he could do to help. Friends who offer advice, tutoring or just prayers and sympathy. 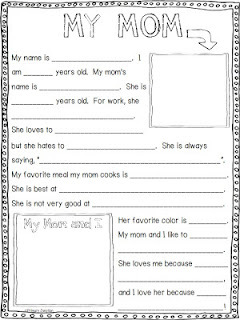 You know those cute fill-in forms kids sometimes get at school around Mother’s Day or Father’s Day? Like this one here. 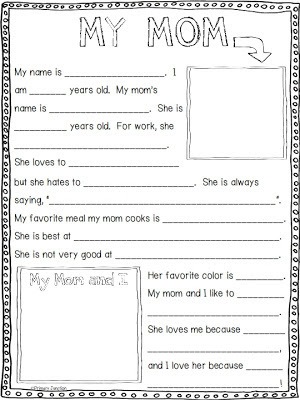 Notice, that one question somewhere in the middle that says: For work she _______. Yes, all of those fall under my job description. I do dishes. Sometimes I do them very grudgingly. Sometimes it is good to stand there and to pray, let my mind wander, laugh at a podcast, all the while not really thinking about the mechanics of what I am doing. I work on the computer and read. I read for pleasure, always have done. But I also read for my job. I am currently reading through a list of books and articles as part of my training as an anthropology consultant. I also write up short papers on these books, read online articles, write e-mails, respond to supporters, send out newsletters composed largely by Evan, post updates on our facebook group…many, many things on the computer. But all this is the in-between. It is my job, and it isn’t. It is the fill-in parts. The part of my job I do when I’m not making food for, cuddling with, tucking in, praying with, building legos, drawing pictures, reading to, hustling out the door, wiping tears, bandaging wounds, laughing with…my kids. They and the home we live in…along with Evan and making sure he is able to do what God has called him to do…that’s my job.